The extreme operating conditions in your business require sensors with special mechanical, electrical and thermal adaptations. Pyrocontrole performs the qualification programmes required for these applications and guarantees the traceability and reproducibility of the items supplied. Examples of applications: temperature measurements during the manufacture of aircraft engine parts, temperature measurements on engine ducts, industrial furnace mapping, temperature measurements in the boosters of Ariane rockets. Temperature assemblies for monitoring the temperatures in heat-treatment furnaces (tempering and solution annealing). Applications: heating processes for manufacturing metal engine parts, fuselage elements, etc. Subjected to temperature stresses, the sensitive measuring elements of these sensors are protected by sheaths made of a material suitable for the environment. 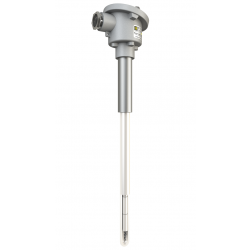 These K, N and S thermocouples are manufactured in compliance with the AMS 2750 standard, in accordance with the NADCAP specifications. The accuracy and uniformity of a furnace's holding temperature are crucial features for the quality and cost of the heat treatment obtained. The PYROTRACER digital recorder is an ideal tool for checking furnace temperature uniformity. Designed specifically for quick, simple configuration and implementation, this "plug & play" paperless recorder can be used to monitor the temperature in real time and record up to 18 measurement channels. Totally secure "QUALITY" recording by means of unfalsifiable encrypted files. These data recorders with touch screens are ideal for data acquisition and analysis of the process. With their secure data storage and easy access to the recordings, this series is suitable for a wide range of applications. Control is crucial to optimize your temperature settings. Equipped with cutting-edge technology, the Thyritop 40 and Thyritop 30 power controllers are ideal for professionals' requirements in this area. This communicating power controller controls all the resistive and inductive loads for electric heating systems. Available in 3 versions, from 37 A to 2,900 A, it offers accuracy, flexibility and a rugged design in order to control heating elements. The Thyritop 30 models are designed for the most frequently-encountered electrical power control requirements. Simple to use and particularly rugged, this is the least expensive power control solution. New-generation supervision solution ideal for supervising industrial processes. From data recording to control of the machines, the new CPS Touch® range of touch human-machine interfaces offers multiple advantages. Comprising 5 models, from the simplest to the most sophisticated, the CPS Touch® is suitable for all supervision requirements.